I won’t beat around the bush — “Solo: A Star Wars Story” isn’t great. It’s not terrible, but it’s definitely not great. To anyone’s who’s been paying attention to this project, a middling reaction shouldn’t be shocking. Since day one of pre-production, “Solo” has seemed like a patently unnecessary film conceived mostly out of corporate insistence. When production itself didn’t exactly go the smoothest, either, it only reaffirmed the film’s inevitable mediocrity. Anyway, I’m getting ahead of myself. Soon after this deal, Disney announced “Star Wars: Episode VII” would roll out in 2015, with each installment of the new trilogy hitting every other year. The years in between would serve up an interim film that chronicles a side story taking place elsewhere in the “Star Wars” universe. Frankly, this wasn’t a terrible approach. It provided a really special opportunity to roll the dice and explore some exciting, original tones, characters and ideas without messing with the main canon or alienating those who might only be interested in the episodic storyline. And no matter what they’d come up with, each film would still have the “Star Wars” brand on it, so even with the supposed creative risk, a mass audience would still be safely built in. Logically, with that sort of security, a studio would elect to stretch its legs and play, right? Well, no. “Solo” was a corporate decision, make no mistake. The powers that be didn’t give it the go-ahead because of its fascinating story potential; it was because with this property, you don’t just get Han, but also Chewbacca, and Lando, and the Millennium Falcon, and the Kessel Run, and a dozen other familiar elements that are marketable in mass merchandising. In an executive’s mind, an average viewer is way more likely to buy a Han Solo toy than a toy of some new untested character. In his familiarity, Han Solo theoretically begets instant profit, and that’s what “Star Wars” is really about now. Hopes seemed to reignite a bit when Phil Lord and Christopher Miller, co-directors of “The Lego Movie” and “21 Jump Street”, were hired to helm the project. Having those names attached indicated creative intention — the studio was aiming for something tongue-in-cheek, which was one way a film about young Han Solo could actually fly. Maybe, despite itself, the movie would work out. But then, over 80 percent of the way through principal photography, Lord and Miller were suddenly fired from the movie. A month later, Ron Howard came in to fill the director’s chair, and re-shot upwards of 70 percent of the footage. Without speculating on those details, that’s a highly dramatic development for a movie production, and it implies that Lucasfilm demanded a very particular movie at any cost. Creative wiggle room in this dojo there was not. Having said all of this, it’s very difficult for me to review “Solo” as if it’s a normal movie. It simply isn’t. Any of the big answers in Han’s young life that you anticipate discovering in this movie would probably be more satisfying as speculative guesses between you and a creative friend. I think on most fronts, even moderate fans could come up with something better. Most of the story decisions made here were toothless, unengaging, and even kind of forgettable. When you have characters like these, ‘forgettable’ shouldn’t even be on the radar. Alden Ehrenreich as Han is okay — decent, at best. He’s effective in moments when he has to stand there and grin smarmily. He did get some of those classic Solo expressions down. When any layered acting takes place, though, he doesn’t feel like Han at all. The performance is a mixed bag, and as the protagonist of the movie, that’s problematic. Everybody else is fine. 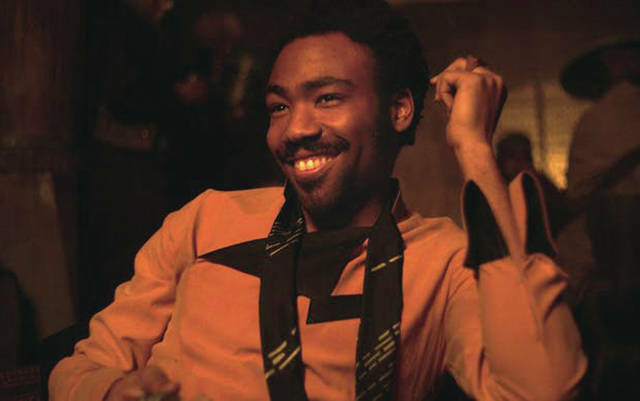 Woody Harrelson is reliably consistent in his mentor role, Donald Glover is charming as Lando despite having too little to do, and the film’s usage of Chewbacca is probably the best since “Return of the Jedi,” bringing him back to the forefront as an actual character rather than a prop that stands next to Daisy Ridley. Emilia Clarke from Game of Thrones is here, too, playing “token lady love interest,” but even her character isn’t utilized as effectively as she could’ve been. In summary, all the actors were only as good as the material they were given. A weak script creates a very finite ceiling for an actor, so it’s not all their fault. The special effects were high-quality, as always — I admired the heavy use of elaborate sets and practical creature effects — but in an age where all the money in the world is being thrown at these films, special effects aren’t impressive anymore. Any movie that costs $200 million better look good. Not to sound like a broken record, but if the script is undercooked — if character motivations aren’t compelling, and clever storytelling isn’t a priority — then why should any of us care about the window dressing? Who cares if a CGI spaceship is beautifully rendered if a viewer is struggling to even pay attention? This brings us to the film’s direction, and it raises a subject I’ve been scared to mention for a long time — Ron Howard is not a great director. His movies are almost always lacking in personality or pinache. He doesn’t seem to direct scenes with any flair, outside of just making sure necessary elements are in-frame. The lighting and color palette are drab, the editing and pacing are systematic and lifeless, and the shot choices are all status quo. Because of this, watching “Solo” is a little like eating pizza with clogged sinuses; even though it resembles something you’ve enjoyed consuming many times before, it’s difficult to feel much joy since almost no flavor can be detected. It doesn’t help that these new movies are all riddled not-so-subtly with progressive ideologies and zero moral ambiguity. There’s a moment in the film when “Han shoots first,” dispatching another character somewhat unexpectedly. As the character fades away, they actually vocalize that Han “made the right decision, because I was about to shoot you, anyway.” You could almost see the giant Disney post-it notes demanding that all doubt be removed that Han is in any way a bad guy. It’s like they think the viewers are all a bunch of imbeciles. Was there anything I liked? 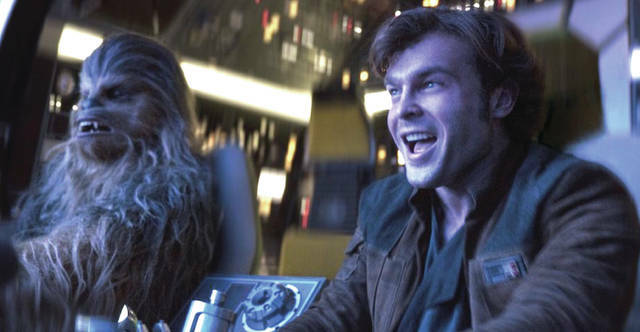 I liked the dynamic between Han and Chewbacca; their camaraderie is something the movie had to get right, and I’m glad they didn’t overexplain it. Great friendships are built on effortless chemistry, and Han and Chewie had that. I liked all the costuming, which was unfortunately downplayed by the movie’s poor lighting. Also, I liked a bonkers character cameo that happens near the end; it didn’t make much sense, but it was one of few moments that got an audience reaction, and I appreciated the audacity of it. That’s about it, really. Would I recommend seeing “Solo” in theaters? Probably not. Unless you’ve got zero exposure to anything in this franchise, I don’t foresee anybody watching “Solo” without experiencing mild disappointment. It’s apparent even from the marketing materials that this thing was produced to sell toys and Twinkies, which is a terrible reason for any movie to happen. Sadly this isn’t over — already films have been announced for Obi-Wan and Boba Fett, with rumors also swirling for a Yoda film and even a Jabba the Hutt film. This is not even mentioning the potential for more Han Solo films, which given this film’s ending, the studio clearly wants us to want. My hope moving forward is that if we are to have pointless origin films, then compelling origins for the characters should be the top priority. Something tells me such hopes are naught but a humble pipe dream.